Prof. Georg Trump (1896-1985) was a teacher of graphics and a type designer with a particular interest in scripts. His major work was the old face type family, Trump Mediaeval. Delphin®, designed for hot metal type setting, features very small capital letters in an upright position in contrast to the lower case alphabets being right angled. This font has a calligraphic feel, especially the lower cases showing the artist’s handwriting with a feather. 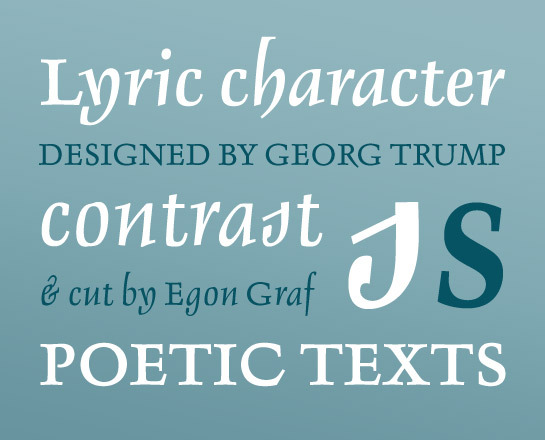 A font with a personal flair, for special occasions. Download a printable sample of Delphin as a PDF.